If you’ve ever wanted an air cooler that assures matchless efficiency and performance for a long period, then switch on to the high-end VGD65H desert cooler. 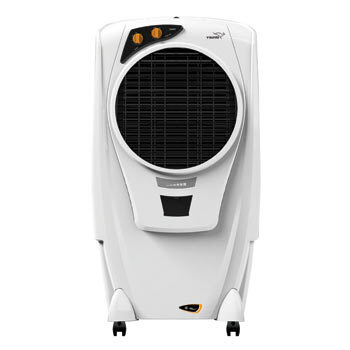 Equipped with an Ice chamber for enhanced cooling that provides an accelerated cooling effect, VGD65H offers one of the best in-class air deliveries among air coolers in India. Coming to you with an auto-fill float valve and water level indicator, this stylish cooler is designed with an aerodynamically balanced body that assures stability and sturdiness to the product. Designed to work under wide voltage ranges (160V ~ 270V) on extreme input voltage conditions in urban & rural areas, this product is equipped with Unidrip flow water distribution which assures proper wetting of cooling pads by uniform water distribution. VGD65H offers enhanced protection for the main motor and pump motor and safeguards provision against extreme usage conditions and malfunctioning. Equipped with Tetra Air Flow Cooling for equilateral cool air flow to all directions and for more area of coverage, this product also boasts of corrosion resistant fan blades that help to avoid rusting of fan blades. What’s more? It also works efficiently when on invertors. A completely value for money product, indeed. Free wheeling castors with brake wheel provision on front two wheels.